As the crisis in Catalonia rumbles on, with Spanish state repression meeting mass and increasingly militant resistance from the people, David Jamieson spoke to Barcelona based Scottish activist Jenny Morrison about the background to and nature of the dramatic political developments in the country. David Jamieson: Can you give us a quick background to the crisis in Barcelona and Catalonia? How did we get to this point? Jenny Morrison: The immediate roots of the current situation lie in the emergence of movements after the economic crisis of 2008 which question the validity of the ’78 regime – that is the constitutional settlement of the Spanish transition to democracy following the death of Franco. The Transition Pact involved the re-establishment of the autonomous Catalan government repressed under the dictatorship but also wrote into the Spanish Constitution that Spain is ‘indivisible’ effectively prohibiting claims by any of Spain’s historic nationalities to independence. However, following the financial crisis a surge in criticism of the existing political system and demands for real democracy combined with frustration at Spain blocking increased autonomy for Catalonia to create a mass movement for independence. The political repression we’ve seen this week follows years of the Spanish government refusing to sanction a referendum or engage in any dialogue regarding independence despite the fact that the Catalan government has a pro-independence majority. DJ: In Scotland we are used to a very different strategy from the state – one of allowing a referendum (at least in 2014) and believing in the state’s capacity to win. What is it about the Spanish/Catalonian situation that leads the Spanish state to a more overtly repressive strategy? JM: The transition in Spain was infamously controlled by the ‘reformist’ forces of the dictatorship resulting in what is often termed a low intensity democracy where basic political and civil rights were granted but the individuals and state bodies of the Franco regime remained intact. Many feel the current Conservative People’s Party (PP) government maintain a particularly authoritarian bent out of step even with other European conservative parties. This is not limited to the Catalan situation as the response of the PP to the ever deepening general crisis of the Spanish state was to pass the ‘gag law’1 limiting freedom of assembly and spech in an attempt to limit protest. But I think the attitude of the Spanish state right now is also driven in part by the knowledge that they have lost control of the Catalan situation and a Yes vote is very possible. While polling still suggests a no vote is in the lead, the vote is likely to be very close in a way the British state assumed the Scottish vote never would be. DJ: What is the mood on the street right now? What popular actions are underway? JM: There’s a huge amount of solidarity and optimism on the street at the moment. Many people are saying that the Spanish state may have just signed its own death warrant, although its also true that the road ahead will not be easy. This week there’s been mass protests, students have occupied their university, the reposting of pro-indy propaganda torn down by the police as well as the nightly ‘casserolada’. Every night at 10pm thousands of people take to their balcony to drum a pot filling the air with noise in a really evocative way of showing solidarity. DJ: Could you also speculate on why the generalised crisis of neo-liberalism and the global political polarisation keeps throwing up these situations – national questions in long established states but with popular left and working class sentiments and militant actions? JM: The 2008 crisis and government responses to it exposed the brutality of neoliberal ideology. Yet there was a limited organised political response in part at least because across Europe the traditional parties of social democracy had remade themselves in a neoliberal image and the power of the trade unions was greatly reduced after decades of neoliberal onslaught. The decline of traditional social democracy often also ruptured old national allegiances which were based at least in part on solidarity around the welfare state etc. In such circumstances the national question can offer a vehicle for left wing demands, even popular revolt as we’re currently seeing in Barcelona. But the national framing of left wing demands is not without a lot of contradictions. It’s worth noting that both the Catalan right and left are split on the national question, but it is the pro-independence Catalan right that tends to lead the nationalist bloc. Large sections of the working class tend to oppose independence, while the traditional centre of Catalan radicalism Barcelona has among the lowest levels of support for independence across Catalonia. If the left is to gain in Barcelona it still needs to win key arguments across the working class. DJ: What are the strategic perspectives for the movement in Catalonia? How can this movement win? Even if the Spanish state has blundered its reaction – does that mean an easy road ahead for the Catalonian movement? JM: The road ahead is far from straightforward. If a vote is able to go ahead on 1 October then turnout is going to be key. As it currently stands many no supporters will not vote meaning the vote may get a large majority for yes but on a low turnout in which case it will lack popular legitimacy. The call for a general strike from the CGT – General Confederation of Labour – offers a possible way forward that could disrupt the Spanish state’s insistence that everything should continue as normal. If the labour movement can pull behind independence it may also be able to shape the movement towards the left. It’s a great analysis from Jenny, very lucid and informed. It’s worth pointing out that the referendum on the 1st of October cannot under any conceivable circumstances deliver independence. Catalonia is part of Spain, there are military, police and judges there who will not allow it to happen. UDI is a practical impossibility – unless you have the Revolution of course. Which is what the CUP want, but not most Catalans. No, as far as I can read the situation, what the Catalan leader Puigdemont and Junqueras from Esquera Republicana are trying to do is force a constitutional crisis in Spain, which would lead to the downfall of Rajoy and the PP and deliver a Spanish government which would grant the right to self-determination for the Catalan people… unfortunately, my fear is that the opposite will happen, that Spain’s reactionary forces will be strengthened more than anything else. This is always what happens in Spain, and has happened for centuries. Spain is basically a left-wing country. But it is a left-wing country with a divided Left – into nationalism, communism, socialism and anarchism – whereas the Right is united like nowhere else I can think of. There isn’t even a far right-wing party in Spain of any weight; the far-right don’t need one, they’re quite at home in the PP. Podemos support a binding and legitimate democratic referendum in Catalonia. Unfortunately for all of us, the PSOE – the Labour Party in Spain – do not do so. So there is no alternative coalition government waiting in the wings with the solution. The Labour Party and the PSOE have everything in common in terms of their attitude to Scotland and Catalonia…. Meanwhile, Rajoy and the draconian measures he has taken, sending over 1000 policemen to Catalonia from the rest of Spain, have set a scene for what seems to me like inevitable violent clashes, bloodshed, and even loss of life…. Interesting comments Red Gauntlet. When it comes to the bit, the suppression of democratic choice inevitably results in a manifestation of put up or shut up. How the central government handles the suppression of choice and to what extent Catalans baulk at this suppression, will be key. Catalonian independence has been pursued for a long time now, the dream has not died, and like the Spanish Civil War, or indeed 1916 Ireland, or the last 30years in NI, a peaceful outcome in not guaranteed. Things change through force and very rarely from anything else. If the Catalans leave Spain, what will happen next? Then the Basque Country will go….Lenderkari Urkullu has already said that if the Catalans are going to have a referendum, they will be having one too in Euskadi thank you very much…. Potentially, the whole country will fall apart. I would rather it stayed together. And there will be violence. The Spanish Right would rather leave the EU than lose Catalonia or the Basque Country…. If one is not allowed to leave then one is imprisoned. If the Catalonians are not being allowed to decide to stay or leave, then they are imprisoned. This Red Gauntlet can never be a recipe for stability. But maybe stability is something Spain can live without. Ireland our closest neighbour has particularly over the last century been an example of lack of stability that the Westminster government has been willing to tholl. The 3,000 plus dead and many more injured in NI alone, together with the horrendous UK mainland bombings and assassinations reinforces the absolute resolve that Westminster, and indeed the long suffering English populace has to sustaining Northern Ireland as a part of the UK. Indeed, like Spain, it was for the UK government a price worth paying, and a price that would undoubtedly be proudly paid again. The establishments in Madron and London will only ever relinquish control when forced to do so. Democracy is not in their nature and I suspect you are sadly correct when you say that you think that Catalonia will suffer future violence. Maybe it is the price of greatness but ultimately somebody has to lose. I can’t avoid thinking that it was bad politics to call a binding referendum, which the Madrid government would be certain to oppose ruthlessly, as has happened, before dealing with these weaknesses. To say that calling a binding referendum is bad politics is something that many would disagree with. There have been two recent referendums here and were they bad politics? Maybe they were in some people’s eyes, and that is certainly true of the Conservatives who opposed the Scottish referendum, and who would oppose another Scottish referendum. And so if giving people the choice is bad politics Florian, what then is your alternative. Maybe like the American Constitution, people should have the right to bear arms so that they can resist a government that has turned against them. Would that be your solution if democratic choice is to be denied. Maybe indeed much better to consider the argument on the weight of force, and to which it is said that there is an equal and opposite reaction. Send your champion to fight my champion is it Florian? Or better still, send your young men to fight your opponents young men, and let the best army win. We’re pretty good at that, we’ve got the battle scars and our glorious dead to commemorate that. But I digress, democratic choice is bad, as long as you are on the winning side…. and keep winning. The problem with the ‘binding referendum’ due to take place in a couple of days is that those who initiated it lack the capacity to enact the consequences; ie bring about an independent Catalunya in the event of a majority voting for independence. They may be unable to guarantee that the referendum itself takes place in any credible manner. I do not know what happens next. The worrying thing is that those who called the referendum don’t either. Again, that strikes me as bad politics. I think everyone agrees that Catalans should have the right to decide on self determination,should they so choose. What happens after that is a matter for real politik. What I don’t get is that should Catalonia continue to be subject to European laws and courts,in the same way as the rest of Spain and beyond,what is the problem with them being independent of Madrid control? In the EU,internal borders now have little or no significance. The essence, the very core of Spain, is the union of crowns between the kingdom of Aragon (Barcelona) and the kingdom of Castile (Madrid) in 1492 – in the form of the marriage of Isabel of Castile and Fernando of Aragon – which was followed by the “reconquest” of Granada, the expulsion of the Jews, the discovery of America, and the publication of the first ever European grammar book, of Castilian Spanish… all in the same year: 1492. 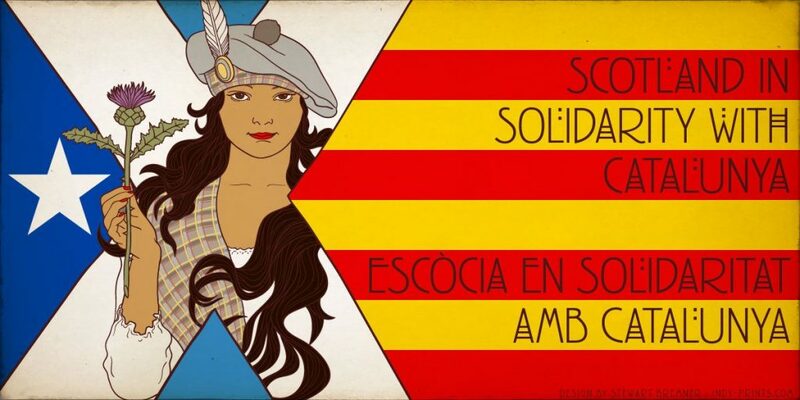 Catalonia leaving Spain is not like Scotland leaving Britain. It’s like, say, Northumbria leaving England… that’s what we’re talking about…. I don’t really think the Northumberland analogy holds. It has been an undisputed part of England since at least the 12th century and, however strong the local dialect, does not have a language of its own. Nobody has ever suggested devolving power to it, and when devolution to the north-east of England as a whole was suggested by Blair, it was overwhelmingly rejected by the area’s voters. By contrast, Catalonia retained extensive powers even after 1492, up to the beginning of the 18th century, it has its own language and it enjoyed devolution, albeit briefly, in the 1930s. The fact is that, despite what the 1978 Constitution may say, Spain has always been a country of strong local, regional and national loyalties, where centralism is – with good reason – closely associated with the authoritarian right. Not for nothing were Ferdinand & Isabella such key referents for Franco. In other words, while Catalonia and Scotland are of course different cases, the differences are not as large as all that. You’re right, fair enough. I’m not actually comparing Northumbria and Catalonia per se so much as trying to convey what catalonia or euskadi mean to the idea of spain itself. They are both integral to it. England will always be England, whether Scotland leaves the union or not, whereas if catalonia leaves spain, the country ceases to exist and becomes something else. Of course, you can argue that would be a good thing, but as we are seeing, there will be violence from fhe spanish right…maybe even another civil war.. Sadly, it’s true that the Spanish right will go to considerable lengths, but I think another Civil War can be effectively ruled out, for a number of reasons. Whether ‘indissoluble unity’ matters so much to Spaniards in general is a moot point. I guess you can only hope that what has happened today will discredit both Rajoy and his ridiculous approach (and perhaps also the more unreasonable elements on the Catalan side, too) and enable a proper referendum to be held in due course. And also ensure the change of government that Spain – with or without Catalonia – so desperately needs. Ah well, with the violence that has now arisen we shall see where it all goes. Sadly when one stops people one putting a cross in a box the response, it has the effect of puting a cross on a box. And all rhey wanted to do was vote.